Kinetics offers the design and engineering assistance to integrate our line of duct silencers, sound attenuators into a system solution. As a result you may choose from a selection of standard or custom engineered duct silencers that will satisfy the requirements of each application. Prime candidates for noise control measures are openings into and out of noisy environments. This includes the ventilation of buildings, enclosures, and equipment rooms. 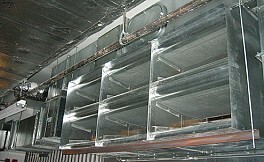 Integration of noise control measures such as silencers and louvers, into the system design requires careful consideration of space constraints, fan selection and aerodynamic pressure losses. All Kinetics® silencers are backed by independent testing in a NVLAP accredited laboratory in accordance with ASTM E477-06a and AMCA 1011-03. Please contact Glenn, Kent, or Tyler with your inquiries.